When crocheting in the round, there are two different ways to progress through rows. At the end of each row, we can join the last stitch to the first by making a slip stitch at the top of the first stitch (the “traditional” way); or we can continue working on to the next round by making the first stitch for the next round on top of the first stitch of the row below (working in a spiral). There’s a slightly visible line in the work, where the ladder stitches are (in this case, the ch 2 that substitutes for one hdc stitch). There are no visible lines in the work, since no ladder stitches have to be made. This also makes for a more solid construction. Shape is more uniform. 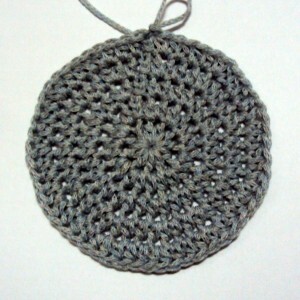 If you’re crocheting a circle or a square, it looks like a circle or square at the end of each round. After the end of each round, the last stitch sticks out from the rest–you’d have to join it to the first stich(es) of the previous round to make it uniformly-shaped. Stitches are easy to count and check for each round. Beginners have to use stitch markers (see below) to keep track of the work. If the pattern calls for stitches in varying heights, it would still come out uniformly-shaped. When using a pattern with stitches of varying heights, the work may come out warped. Stich markers are used to keep track of stitch counts, or your progress in a pattern. It can also be used to secure the hanging loop in your crochet work when you set it aside to do something else, to prevent the work from unraveling. Craft stores sell a lot of various kinds of stitch markers–everything from your basic plastic ones to fancy gem-laden ones. When working in spiral, it’s going to be a little difficult to keep track of where you are in the work (unless of course you have an outstanding memory!). So we put stitch markers either at the end of each round, or in the first stitch of each round, so we know where we are. This way, we can check the number of stitches for each round. I’ll tell you a little secret: you don’t have to spend anything at all to be able to mark your work! I actually don’t own a single one they sell at craft stores. I use everyday stuff like paper clips, safety pins, orphaned earrings, or even a piece of discarded yarn. They’re categorized as “accessories” in craft work because you don’t actually need to buy them. Alternatives abound everywhere! I hope that was helpful. If you have any questions, just leave a comment below and I’ll get back to you when I can. This entry was posted on Tuesday, February 1st, 2011 at 12:06 AM by Claire Ortega-Reyes	and is filed under Tutorials and Help. You can follow any responses to this entry through the RSS 2.0 feed. You can leave a response, or trackback from your own site. I’m an advanced beginner in crochet. Your explanation helps me understand why hat patterns have you slip stitch at the end of each round in spite of the seam it creates. My question is, how do you minimize the “look” of the seam? Another question–if you decide to work in the spiral, (say you were making a hat), how would you ensure it didn’t warp or at least minimize it? I noticed if you insert your hook from behind the first stitch, instead of from the front like you would normally do, it’s less visible. 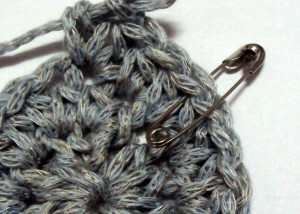 Also if you have big holes try chaining one and crochet into the same stitch you’re in for the first stitch. I think it all depends on what stitches you’re working for the pattern. For sc stitches, the seam and the uneven end in the spiral aren’t as obvious as for taller stitches. To reduce the look of the seam, don’t count the ladder chains as stitches (beginning chains in the round). For example, if you’re working dc stitches, do the ch 3 or ch 2 at the beginning of the round, but still make a dc in the first stitch–ignore that beginning ch 3 or ch 2. For working in the spiral, make sure to anchor the last stitch of the spiral to an appropriate stitch in the round below. For example, if we work in sc, at the end of the spiral we sl st into the next stitch, and all’s well. But for taller stitches, skip a stitch or two before making a sl st, so the shape will come out more uniform. i personally find that ignoring the chain makes all the difference, though with projects such as granny squares, it makes it (very) slightly bigger. also, i only chain1 for sc, 1 for hdc, 2 for dc, and 3 for trc. i gotitin my head as a beginner that single meant 1ch, double meant 2 ch,ect. I always have trouble crocheting in the round no matter how tight or how loose I make my stitches. My round always wants to turn into a bowl within the first couple of rows & it just continues to worsen. How do I eliminate this problem?? Hello tamstrunk. 🙂 You might want to check out some of Rachel’s very helpful and relevant posts: How to Crochet a Circle, or if you want to make squares, How to Crochet a Granny Square. I think making work lie flat is more dependent on making the right number of stitches per round, and less on the hook and yarn used. Be sure to always increase the right number of stitches per round. For example, when making a circle and you start with 8 stitches in the first round, be sure to increase 8 stitches each round, and using the same kind of stitch too. That is interesting and helpful. Thanks. I hate using stitch markers. If I want to make a hat, which usually calls for the spiral method, can I substitute the traditional way and have it come out the right way? I have not tried it yet but hope to hear that it can be done! thanks. I am fairly new to crocheting and this is what I have a problem with. Thanks for the info. Thanks Claire! I will try the circle pattern prior to the beanie & see what happens! I keep hearing how easy it is to crochet in the round! I am so glad you posted this article! I make lots of chemo hats, and am constantly fretting over the look of that joining seam. I’m going to have to try some of these suggestions out soon. I hope to see more suggestions on this post from others who have solved the dilemma of the visible join. In using the join and ch1 at the beginning of the 2nd row, do you then crochet in the joining st, or the st after that? I have done the ch1 and join only once and ended up with extra stitches. I also did not like the slight line it produced in my hats. Also doing a spiral hat with colors at the bottom how does one eliminate the uneven jog when you join the new yarn? I’m and 87-yr old newbie to crochet and am self-tauft so there are MANY, MANY things I am still learning. Hello Gerry, Wow! I hope I never stop learning, too, if I turn out to be blessed enough to reach your age! My personal preference is, to join the last stitch of the round to the first stitch (not the chain one, if we’re doing sc’s). Some people like to do this join in the back loop only of that first stitch for the round, and it does decrease the visibility of that line we get. When working in spirals, that uneven jog you get when you change colors can be made less visible. If say, the hat is made with sc stitches, don’t change colors while working in spiral. Close that first color first by joining the last stitch to the next sc below, and then change to the other color. Hi Marcia, we usually don’t do that for each new row–only when we want to finish working in spiral. I need some help in changing from SC to HDC in spiral crochet. How do I do that?! Hi Denise, you can replace the sc with the hdc stitches. When you work in a spiral you won’t have the join at the end of the rounds. If you do join at the end of the rounds then each of the rounds will be leveled. I’m not sure if I answered your question, so please let me know if you need more help. Thanks for your reply. But I’m not getting it right… Since the HDC is higher it looks kind of wierd at the end of first hdc round. thank you Rachel. I will practice and practice. Hi Krystal, you can switch by omitting the joins when you start the spiral rounds. As you crochet the hole shouldn’t be as noticeable. If it really bothers you can go always go back and sew it shut with a scrap of yarn, but it really shouldn’t be that big of a hole. I have made a circle of 14 rounds and want to finish it off by squaring it how do I do this? yes I am working a pattern for a circle in a square motif but I really want to made a round afghan and then for the last few rounds turn it into a square. Have fun experimenting with it!! hank you so much will let you know the results and may post a picture when the afghan is done. Thank you. At least now I know it wasn’t something I was doing wrong. I am making an oblong casserole dish cover. The pattern calls for working in the round . How in the world does that work with an oblong dish? Can you help me? When you start a new row (in a hdc beanie) do you start with the chain the slip stitch is in or the one after? My rows keep being one or two chains short every row. It would depend on the pattern. Most of the time if you are ending with a slip stitch into the beginning chain you wouldn’t work into the beginning chain on the next round. If you are ending with a slip stitch into the first hdc, then you would probably need to work into the first hdc on the next round. Try counting the stitches when you are done working the round, starting with the first round. That way you know you’ve made the correct number and know where to start and stop the next round. I’m working on making a no-sew pair of fingerless gloves and I’m working in the round in a spiral and I want a nice, clean, even edge. I’m really confused on how to do that since it’s all just spiraling upwards around the glove. Hi Sam, you can make a gradual decrease in the height of the stitches, such as hdc in next stitch, sc in next stitch, then slip stitch in next stitch. I’m making a tote bag in the spiral method using single crochet, and the project just keeps getting smaller and smaller as I go along. Why? Is it because I don’t throw in a few random extra stitches every so often? Also, the left edge is going in an S/ vase shape, and the right edge is going in a diagonal. Why? Hello! It sounds like you may be skipping stitches by accident. It’s really easy to miss stitches when you are crocheting in the round, especially if there are a lot of stitches. The best thing to do is to count the stitches as you crochet each round. You can place a stitch marker at the beginning of the round and move it again when you meet it again at the end. If there are the same number of stitches on each round then each round will be the same, so you’ll get a consistent size throughout. Can someone help me with the following? Ch1, HDC in same stitch. Where exactly does my hook go to do that HDC? Is this what causes the seam? Because if it is, I will just crochet it with stitch markers instead. Experienced at crochet but do not understand how to determine the number of stitches to increase in order to make the piece lay flat. If I have a pattern…no problem otherwise I just have to guess at when to increase. Arrrgh! Can most basic ‘slip stitch to join’ patterns be done in the continuous spiral instead to eliminate that ‘ladder’ join issue? I realize that it depends on the pattern/design of the stitches, but I’m thinking about basic round beanie style hats,etc. 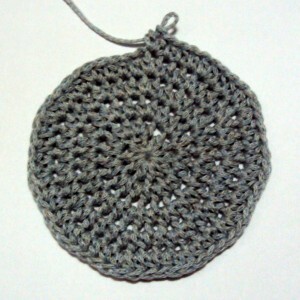 Yes, for the most part, most patterns that are crocheted in the round can be crocheted with the continuous spiral technique. And like you said, it can depend on the pattern. Some patterns just work better with the join instead of the spiral, such as patterns that are striped where you want the end of each round to meet. If I read the pattern above right then (traditional), I need to chain 2 before starting each round then, is that correct? Are you referring to the hat pattern that you mentioned in a previous comment? If so, that pattern doesn’t need the chain, it is crocheted using the spiral method. You are more than welcomed to add a join if you prefer though. Using the traditional method mentioned in this tutorial you can chain 2 before each round and then make a slip stitch at the end to join. Let me know if you need more help with it! I’m making a poncho with a traditional slip stitch to join followed by a turn, followed by turning chain. I’m struggling with how to identify the slip st (I know I can use a marker) and whether to crochet into it or not. Is it pattern dependent and how else can I identify the slip st? I become confused because there is a dc beneath the turning chain. Hi Beverly! The slip stitch is usually a slightly tighter stitch (but this can depend on each person and how they crochet), so the V at the top of the stitch may appear to be slightly smaller than the rest of the stitches. If you can’t visually see a difference, I would recommend using the stitch marker like you mentioned until you can identify the slip stitch without it.